For many years now, Venice and Prague have been on my short list of travel destinations. A list that was thwarted back in 2008-2009, because of unexpected work obligations. That was supposed to be the year of Prague, the year of Venice, the year of far flung travel adventures. But, best laid plans and all that. So 2015 turned out to be the year of Prague and Venice, and many towns in between. I wasn’t going to be thwarted this time around: come Hell or high water, my trip to Venice was going to happen. Well, I’m happy to report that Hell stayed at bay. High water did, however, make an appearance. Venice is prone to this problem, especially in November and December. Seasonal winds, high tides, and full moons all play a hand in this, but, you know, the island of Venice is in a lagoon. The original settlers of Venice moved to the marshland from the mainland to get away from the constant threat of marauders. They knew no one would bother them in the middle of the marsh–no one would make the effort. 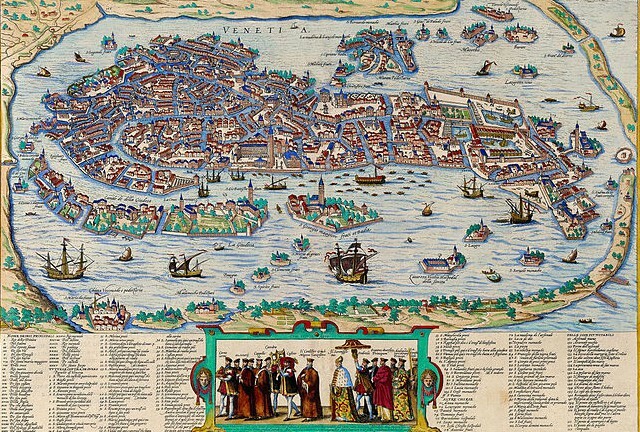 Check out the old map above–note that water is not only all around Venice, but it snakes its way through every “street” of Venice. In fact, water actually IS the roadway of Venice. No cars, just boats. 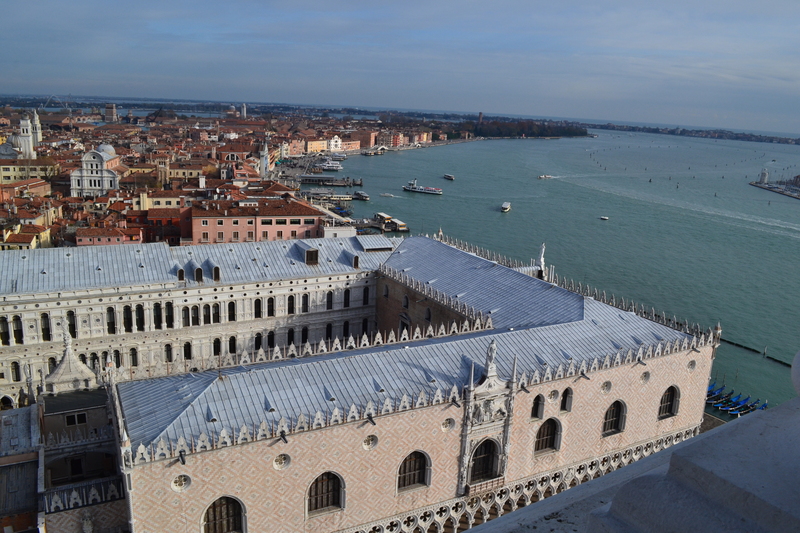 View from St. Mark’s Campanile (bell tower) over the Dogges Palace and out to sea. Obviously Venice has flourished and the marauders were kept at bay, but the sea must be built over the top of and constantly drained out. 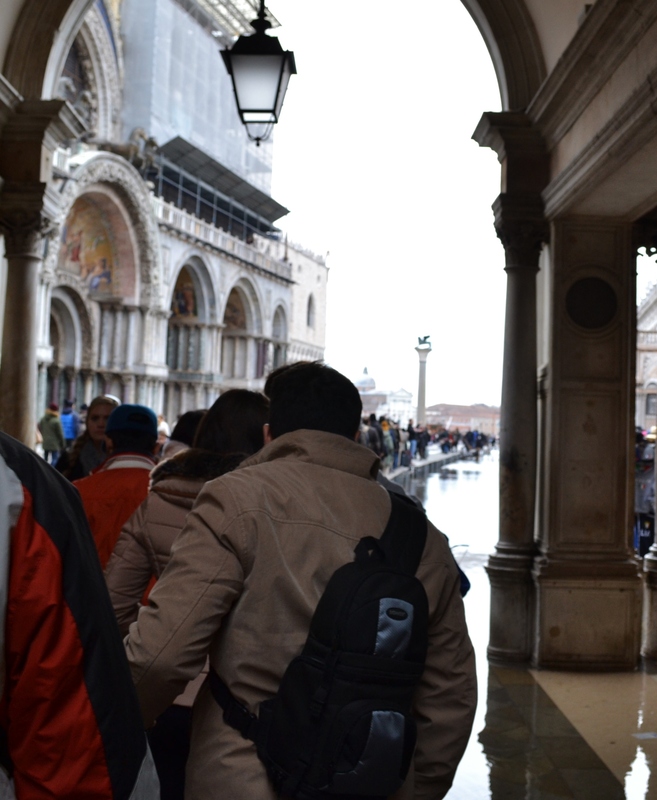 And when the Acqua Alta comes, raised walkways are put in place and life goes on. Pedestrians in single file, walking on “risers” above the flooded walkways. Cafe tables–plenty of open seats, if you don’t mind wet feet! 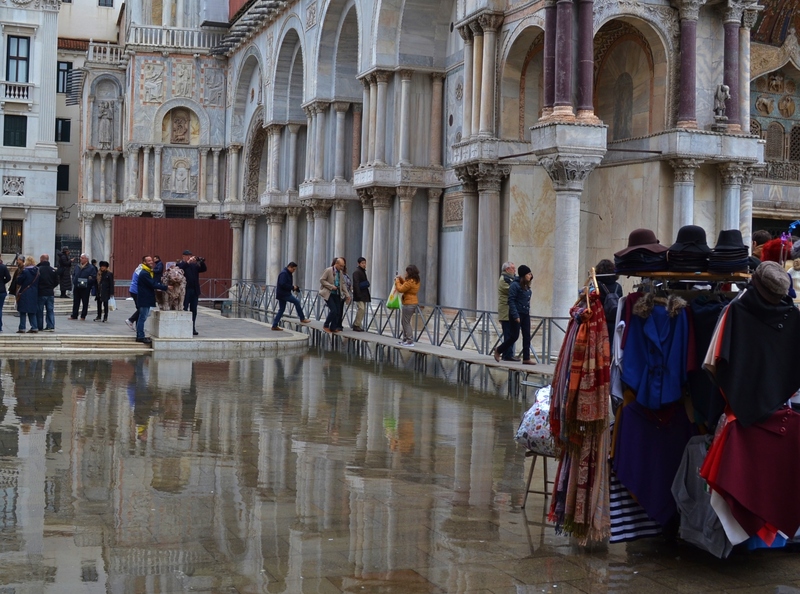 Makeshift waders in Venice’s acqua alta. Even St. Mark’s Cathedral isn’t spared. In fact, maybe especially St. Mark’s isn’t spared. 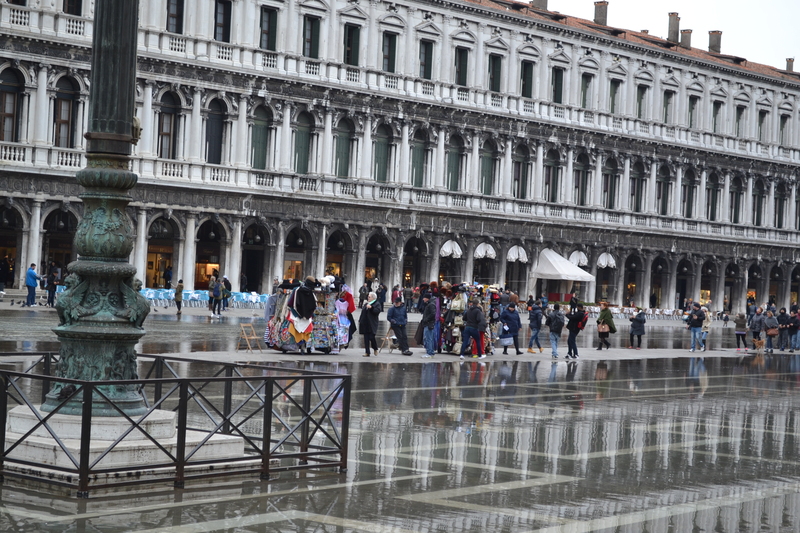 Piazza San Marco is right by the water, so it’s a first stop for the flood waters. The water seems to wash in and linger like an old friend with the locals–and the locals greet it as such. The tempo of life is not much paused: merchants continue their sales as best they can, in boots and waders, while tourists whimper and moan, and eventually just get on with it, taking their cue from the locals. Inside of the Cathedral, the tile floors were beginning to lap with seawater on the morning of our visit. The flooding wasn’t bad this time, but it’s clearly a frequent enough event. The beautiful tile floors of the cathedral are far from level–they are wavy like the sea itself. Whether that’s from years upon years of flood waters spilling through the doors, or from the foundation being built on sinking marshland and bolstered by wooden pilings under the soil I don’t know (every structure in Venice has underlying wooden stakes sunk into the ground/marsh below it to stabilize the building). I will say that I’ve never seen such a wavy floor before . . . but I was absolutely in awe of it. It seemed nautical, like the city itself–as if the very character of the sea, its rise and fall, its most essential quality, was purposefully captured in tile and stone for Venice’s magnificent cathedral. It was beautiful. 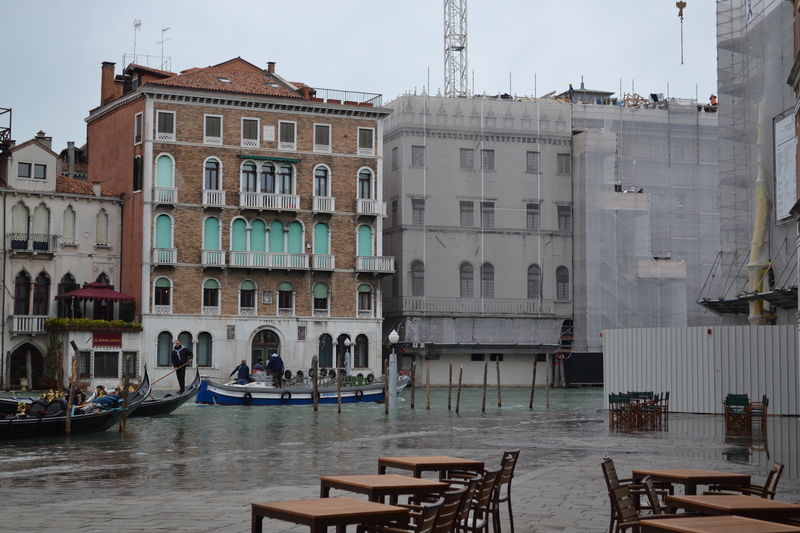 So there you have it–our first brush with high water in Venice. First, the water came up to meet us. . .
. . . and then we went down to meet the water. Or, at least, my husband did. If you are interested in a short “Wonder List” video on Venice’s Acqua Alta, click here. *My daughter and I are about to fly off to catch London Fashion Weekend, so there may be radio silence for a while. But I’ll be back, with photos of London, and a “part two” post about Venice’s Acqua Alta. Until then, Ciao! Another very enjoyable post for me, the vicarious traveler! Parallel lives -I just posted on this subject, as well, but I neglected to get a photo of the duckboards that you show in your excellent post. We were completely unprepared for acqua alta – hope to return to Venice someday when the lagoon stays in the lagoon! I saw your post–in fact, it prompted me to pick this one back up (it had been languishing for a few weeks, stuck in its third or fourth paragraph). I will say that the water only impacted our trip one day, and not badly–at first, we were frustrated by it, but then we thought “well, that was a cool, and very Venetian, experience to have.” Just glad it wasn’t knee deep, though. I hope it wasn’t winter time . . . brrrrrr. 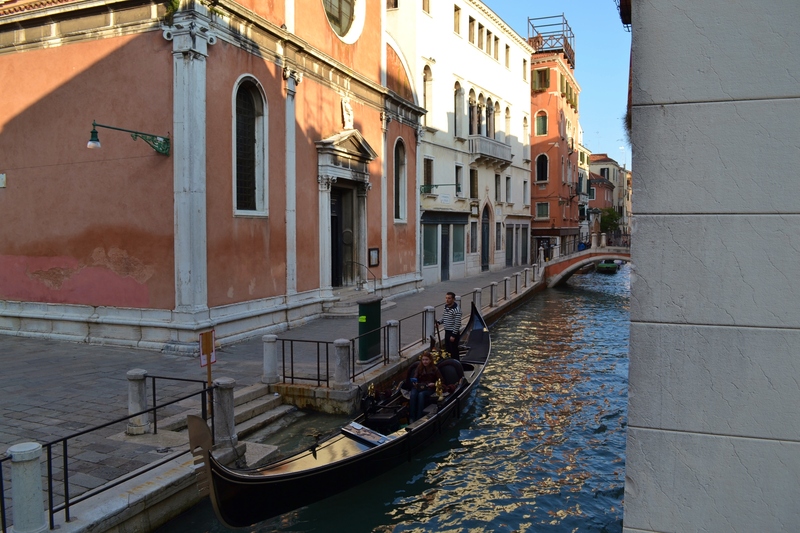 How interesting – I didn’t know flooded streets were a fact of life in Venice! I think high water is usually seasonal. It was actually fun to see.